The European Federalist Party expresses its solidarity with the people of Ukraine and condemns the violent repressions of protests in Kiev and in other parts of the country. 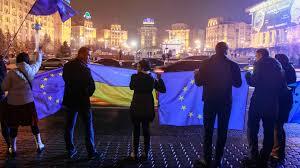 As Europeans and as federalists we are convinced that what is happening in Ukraine these days concerns us all. This is why we in the European Federalist Party want to thank the protesters of Euromaidan: while you are fighting for the future of your country, you are also reminding us all that freedom, democracy and European values are not for granted, and that they exist only if there are men and women brave enough to affirm them with their actions. We praise the peaceful character of Euromaidan protests and we wish that both sides of the political struggle going on in Ukraine always remember that an enemy is, always, a human being. to set up a calendar, in concert with all parliamentary forces, leading to early presidential elections, which should be open to all representative candidates. to commit to respecting the territorial integrity of the Ukrainian Republic. therefore, to impose, without further delays, sanctions on the current Ukrainian top officials (freezing of their bank accounts in European banks and preventing their access to EU territory) until investigations on the violence committed by police forces in the past weeks have been duly carried out. Finally, to all the Europeans convinced that Europe is a dream worth believing in, we ask this: stand by our Ukrainian brothers and sisters. There are many ways to do this: share truthful information about the situation in Kiev on social media; talk about it with your friends and family; send an email to your elected officials in the parliament of your country asking to act about Ukraine rather than simply standing and watch. And, if you have the possibility to travel, even for just a few days, go to Kiev: besides being a beautiful city to visit, spring now is coming, and you will find that it makes perfect sense to be there, as Europeans, right in this moment.